Happy Thanksgiving. I hope everyone had a nice holiday (an Iron Bowl win always makes it better). The Alabama basketball team has enjoyed an eight day break following their trip to Charleston. The hope here is that the team is focused on basketball again because they have another challenge awaiting them in Murray State (KenPom: 112). The Racers enter this game with a 3-0 record. Game time is 7:00 P.M. CT. The game will be streamed on SEC Network+. My Two Cents: This game scares me because of its placement on the schedule. An eight-day layoff, a Monday game following the Thanksgiving holiday when, presumably, most, if not all of the team went home for the holiday. If it's tough for you and I to go back to work on Friday after Thanksgiving, the weekend after Thanksgiving, or even the Monday after Thanksgiving, imagine how difficult it must be for a college athlete going home to visit their family, only to turn around and have to get back into basketball (and school) mode quickly, all while preparing to play a good team. Add in the fact that Murray State plays a game 48 hours prior to this game, allowing them the opportunity to work out the kinks of their own holiday layoff (an eight day layoff from Nov. 16-24), and you may begin to understand why this game scares me. Not to mention that Murray State is expected to be a very good team this season; the Racers are once again favorites in the Ohio Valley Conference. I understand the philosophy behind the scheduling we've seen the last two seasons, but in a spot like this, if I was the coach, I would have scheduled more of a cupcake game to help the team ease back into things after the long layoff. 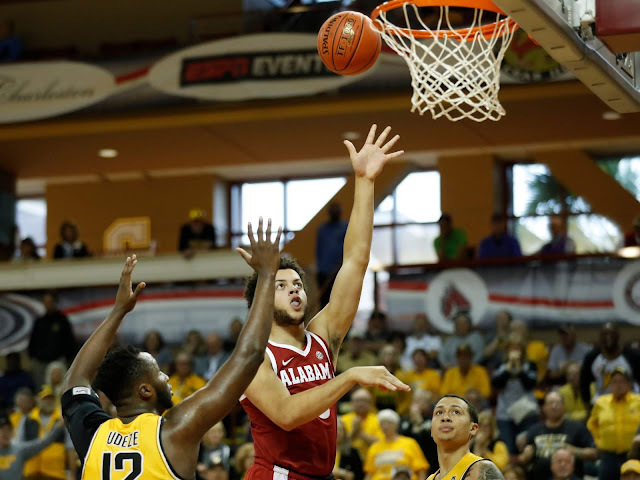 Players to Watch: I feel like I've focused on Donta Hall a lot in this space so far this season, but following his disappearing act in two of Bama's three games in Charleston, it's difficult not to write about him in this space. The team overcame his disappearance against Wichita, but it's hard for me to believe that this team can survive Donta having a stat line of 2 pts, 1 reb, 1 asst, 1 blk and 1 stl in 15 minutes on a regular basis. Every player is going to have some bad games, but Donta having two so close together is concerning. For this team to reach its ceiling, he's got to play with more purpose, and be a consistent presence on the floor. Also keep an eye on John Petty. He didn't appear to be 100% vs Wichita State, and then got rocked on a screen near the end of that game that required him to go to the locker room before it finished. The hope is that he's okay and ready to go Monday night because the team needs him out there. John's overall performance in his first games away from home was encouraging, and he appears to be growing as a vocal leader on the floor. It may surprise you that Murray State could have the highest rated draft prospect on the floor Monday night. Ja Morant is a potential first round draft pick should he choose to enter the 2019 draft, with some mocks that I've seen projecting him as high as 14th. His stats so far this season: 24.3 ppg, 10.3 ast (not a typo), 7 rpg, 3 spg, 1 bpg. Last night vs Missouri State, Morant messed around and got a triple double: 29 points, 13 rebounds and 12 assists. I'm fascinated to see how the Bama coaching staff will gameplan for him. If Morant is allowed to get comfortable in this game, it could be a long night. Prediction: As I've made clear, this game really scares me. There's the very real danger of a post-holiday basketball team coming out flat, a mausoleum type atmosphere in Coleman that is always a possibility for weekday non-conference games against mid-majors, and a quality team with a dynamic player capable of lifting his team on his back in order to secure an upset win. This is an older Alabama team that showed some grit in the way they bounced back in Charleston, and they're at home so I'm going to pick them to win this game. But if we're talking about a 4-2 Alabama team in the aftermath of this game, I won't be shocked.